The Bissell Proheat flooring and upholstery cleaner comes in a few different models, but they all operate similarly: fill the tank with a cleaning solution and water, set your options and clean your surface of choice. One of the key benefits of this equipment is its ability to heat the contents of the tank up to 25 degrees hotter than their starting temperature and then maintain that temperature during operation. This allows for deeper, more effective cleaning. For safety purposes, always have the machine turned off and unplugged when filling the tank. 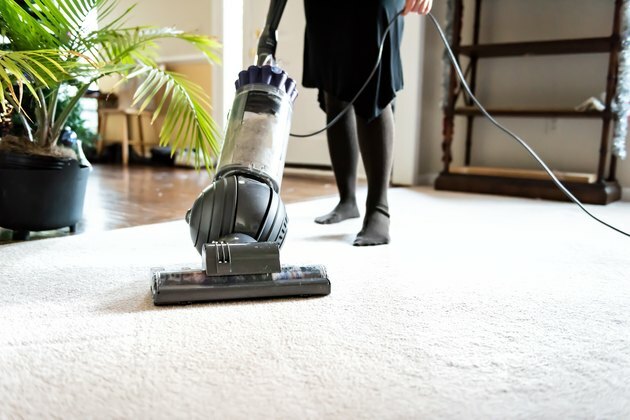 Vacuum the area you're cleaning first, including hard floors, carpet and upholstery, to prevent clogging the machine. Then, pretreat any stains on carpet and upholstery. Enzyme-based cleaners are best for pet and protein-based stains, and an oxygen bleach-based product works beautifully for food spills. In a pinch, dilute a tablespoon of laundry detergent in a cup of water and sponge this directly on any marks. Avoid solvent-based spot treatments, as they can damage the plastic components of the Bissell Proheat. Let your pretreatment cleaner of choice sit for at least 20 minutes to give it time to penetrate the carpet or upholstery fibers. Remove the measuring cup from the 2-in-1 water tank and fill it with a cleaner suitable for the surface you're treating. Bissell makes several cleaning solutions for various surfaces, including a special detergent for hard flooring as well as cleaners with built-in Scotchgard for carpet and upholstery. As outlined in your Bissell Proheat manual, you must use Bissell-made cleaners to keep your warranty valid. After the warranty period expires, however, don't limit yourself. Many cleaners intended for similar machines will work just fine, including your local retailer's off-brand versions of Bissell cleaners. You can also use white distilled vinegar to clean hard flooring and lightly soiled carpet. Add your cleaner of choice to the tank's bladder and then fill it the rest of the way with hot tap water. Flip the Proheat switch on and wait for 2 minutes so that the contents of the tank have ample time to heat up. Set the machine to the floor-cleaning setting and position yourself at the wall farthest from the entrance to the room. If you're cleaning hard flooring, clip the hard floor tool onto the machine's main nozzle. This attachment doesn't come with all Proheat models, but you can purchase it through Bissell. When you're ready, engage the trigger on the handle of the machine and make one pass to dispense the cleaning solution. Release the trigger and make several more passes over the area to suction out the water. Repeat this process, working in 3-foot sections and moving around the room in a manner that lets you avoid stepping on the wet carpet. The owner's manual suggests making one pass forward and one pass backward with the trigger engaged, but this is only necessary if the floor is heavily soiled; applying too much solution makes rinsing difficult. As you work, the equipment disperses the diluted cleaning agent from the tank's bladder onto the floor and then suctions the dirty cleaning solution into the tank, where it collects in the empty space surrounding the bladder. When the equipment stops dispensing the cleaning solution, it's time to refill the tank with cleaner and hot water. Even a small bedroom may require at least one refill during the cleaning process. You can use your Bissell Proheat carpet cleaner to safely clean a variety of flooring surfaces, including standard-pile carpets, linoleum, tile and vinyl. To protect both the machine and your floor, however, avoid using your Bissel Proheat on stone or hardwood floors, including those made of bamboo. It's also best to avoid shag-style carpets and animal-skin rugs, as well as antique and oriental carpets. Make sure that water-based cleaning is safe for your upholstery; if there's a "W" or "SW/WS" on the upholstery's tag, the Bissell Proheat should work well. If the tag is stamped with an "S" or an "X," water could damage the fabric. After checking your fabric, switch the machine to the Ready Tool setting. Disconnect the removable end of the hose from the machine and outfit it with your attachment of choice. Bristled attachments work well for durable upholstery that's heavily soiled, whereas flat attachments are ideal for more delicate fabrics and light soiling. Hold down the trigger on the attachment to disperse the cleaning solution and release it to suction it back out of the furniture. The Bissell Proheat makes quick work of deep cleaning the surfaces in your home, but keeping a few tips in mind will help you avoid frustration and maximize cleaning. Most importantly, opt for low-sudsing cleaning formulas when possible. Excess suds leave behind residue that can attract dirt, forcing you to clean more often. It's also helpful to rinse the lint screen, nozzle and any attachments you're using every time you refill the tank and prior to storage.